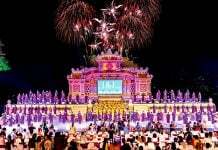 Though Tet's atmosphere is not over yet, Hanoians still welcome Valentine's Day. In the cold of Hanoi during the early days of the year, the people of Vietnam are truly happy, especially when they have an excuse to spend another holiday with their loved ones. Hanoi is even more special because of its inherent romance. Valentine’s Day is a day to honor love. 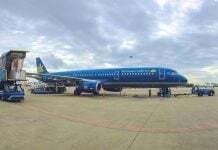 It’s welcomed by most countries around the world, including Vietnam. However, as an East Asian country, Valentine’s Day has evolved in a distinctly Vietnamese way. Typically, on Valentine’s Day, women give red roses or sweet chocolate bars to their partners. However, in Vietnam, due to the concept of yin-yang, female being the yin, having a gentle personality and often not being proactive in love, the men do all the romancing. Therefore, men will actively give flowers and chocolate to women. Similar to many countries, Valentine’s Day is a day to honor the love you share and spend a little extra time in the romance department. Being a capital home to millions of people, Hanoi is extremely busy on this special day. 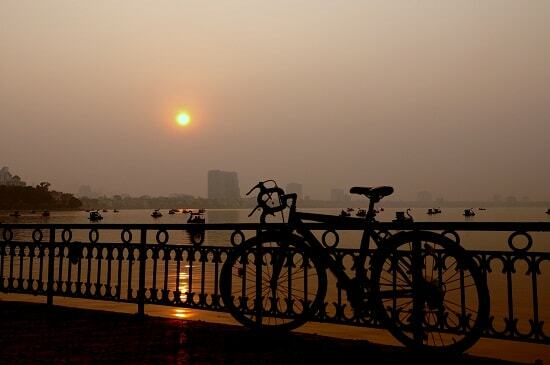 With a calm atmosphere, Hanoi becomes more romantic and poetic on Valentine’s Day. Ben Han Quoc does not have much Korean influence, but I do like to think that it takes after the romance of a K-drama series. This port is a winding concrete road shaped in the letter‘V’ with high-voltage lights and handrail on both sides. Ben Han Quoc offers a rare expansive view without buildings hemming you in: one side is lotus swamps, looking to the side you can see a water park with a giant Ferris wheel, and Tay lake (West lake) also makes an appearance. When the sun goes down behind the blocks of the apartment buildings, Ben Han Quoc is even more beautiful thanks to the cool breeze and the beautiful lanterns of the drink-stall seller. A cup of iced tea, a dozen pickles, and a green mango dish sit until daylight gives way tonight, tell each other stories, and end a beautiful day to begin a fantastic night. The first way to Ben Han Quoc is find alley 399 Au Co street and follow a dike to reach Ben Han Quoc. Be careful, or you may fall into the fields of Nghi Tam’s people. You can also reach this place by finding your way to Xuan Dieu Street, turn alley 52 To Ngoc Van street, and at the end of the alley, there will be a small winding road leading to Ben Han Quoc. Follow Han Quoc road around Tay Lake to reach Ben Nhat Ban. This place is also not related to Japan but maybe the person who named it felt that the tranquil atmosphere reminded them of Japan. Another way to get to Ben Nhat Ban is to look for Dang Thai Mai street, then on the way to Tay lake, ask the local people and they will show you a small concrete road along the lake. This is Ben Nhat Ban. This road stretches from Tay Lake villa area, going through Tay Lake hotel to the water park. Because of the location of villa area, it’s not often crowded, most of the time it remains a poetic and quiet space, which is an ideal place to take a walk with your loved one. Many young couples stop here because of the green trees, sit down on the pavement, admire the scenery, and say sweet words to each other. 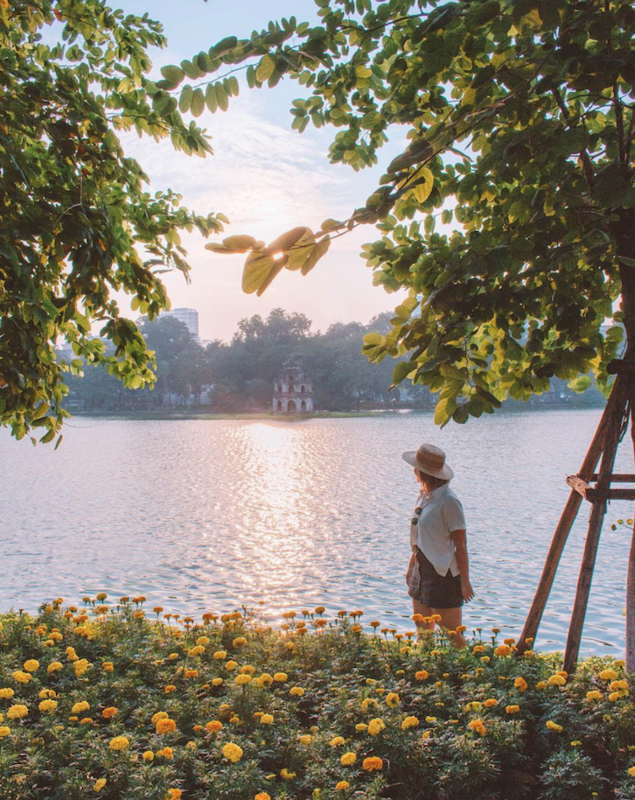 Located between Tay lake and Truc Bach lake, Thanh Nien street has long been a meeting place for couples who love to sit and watch the sunset on the windy lake. Thanh Nien street was an embankment dam in the early 17th century to raise fish in Truc Bach lake, with the length of approximately one kilometer, starting from Yen Phu slope to Quan Thanh – Thuy Khue junction. Thanh Nien street is now one of the most beautiful streets in the capital city of Hanoi with beautiful roadways, wide sidewalks, and green trees all year round. The water surface welcomes the gentle sunshine from the Tay lake side through splashes of foliage silhouettes. In the evenings, this area is crowded with happy people looking for a nice place to stroll. This is also the meeting point of loving couples sitting by the lake bank and saying love’s words. On Valentine’s Day, many couples make a date to Thanh Nien street to enjoy the romantic atmosphere. 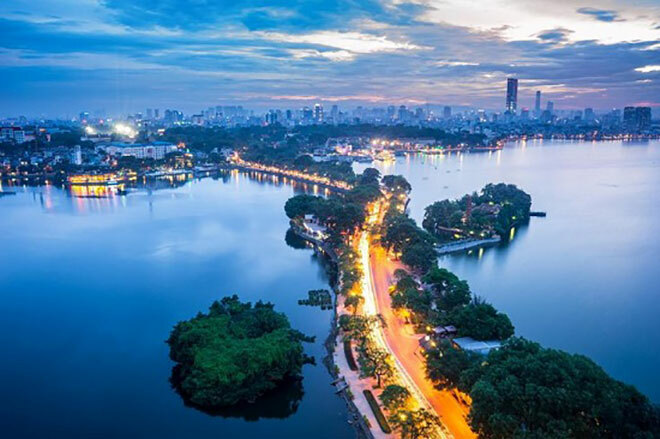 Hoan Kiem lake (a.k.a Guomlake) is an ideal place to experience a gentle and sparkling Valentine’s Day. 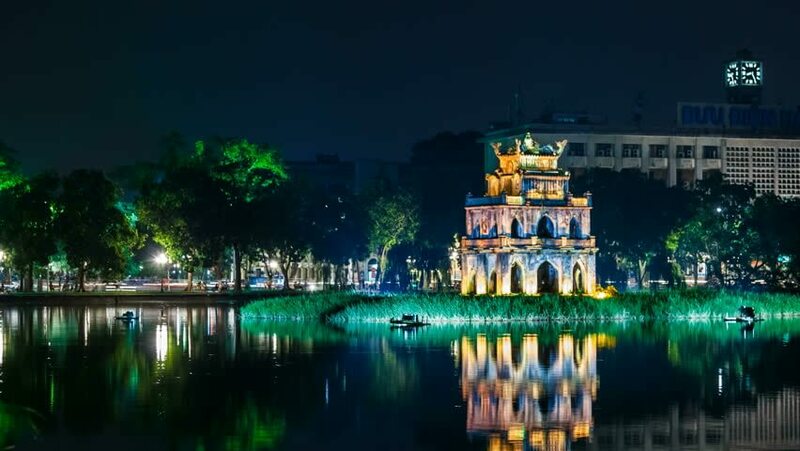 Because Tet atmosphere is still lingering, Hoan Kiem lake still retains the splendor of flowers and lights. Grasp hands tightly as you walk around the lake, taking in the cool breeze and the warmth of love. During a walk, you can also enjoy an ice-cream together or choose a beautiful cafe corner and watch the magical lake at night. You can also stop by a bench at the lake park and tell each other stories. An extremely suitable place for lovers is Long Bien bridge. This bridge was completed in 1902 by the great French architect Gustave Eiffel (who designed the famous Eiffel Tower of Paris). Perhaps because of that, from the ends of the bridge, to the suspended middle, the railway line has a very unique beauty. Imagine Valentine’s Day with Hanoi’s frigid weather, it will be romantic when you walk with your love on a grand bridge, under the yellow lights and trains passing by. For a long time, Long Bien bridge has become a bridge for young people in Hanoi because many loving couples have attached a lock to the bridge with the wish to lock the memories of two people forever so they may never separate. With these characteristics, there is no reason preventing you from choosing Long Bien bridge as a place to have a date on upcoming Valentine’s Day. As a city with more than 7.5 million people, Hanoi is an indispensable capital of entertainment centers to meet the needs of citizens. There are hundreds of malls and amusement parks in Hanoi, where you and your partner can be happy together when playing games, releasing the stresses of life. Some famous recreation centers: Times City (458 Minh Khai street, Vinh Tuy ward, Hai Ba Trung district), Royal City (72A Nguyen Trai street, Thanh Xuan district), Lotte Center (54 Lieu Giai street, Ba Palace district), and The Garden (The Manor urban area, Me Tri street, Nam Tu Lien district). Visit these locations to play the games and capture memorable moments for each other. Besides, they also have supermarkets, if you are hungry and tired, buy food and continue the fun. A cozy and romantic dinner together is also the choice of many couples on the special occasion of Valentine’s Day. Sit opposite each other surrounded by dim candlelights and fragrant flowers, eat together, and share a much-deserved drink. Located on the 19th floor of the Pacific Building, The Rooftop is a destination that you can not ignore if you want to have sweet moments with the person you love on Valentine’s Day. Possessing a classy menu, whether you choose to sit in a cozy room or an inspiring outdoor space, The Rooftop Bar always satisfies your date. A Gia is located in the center of the capital city of Hanoi, in an ancient French mansion, bearing the contemporary character in design, but still displaying unique Asian characteristics. In the partitions, the light boxes dotting the entire ceiling make the restaurant space very cozy and sweet. 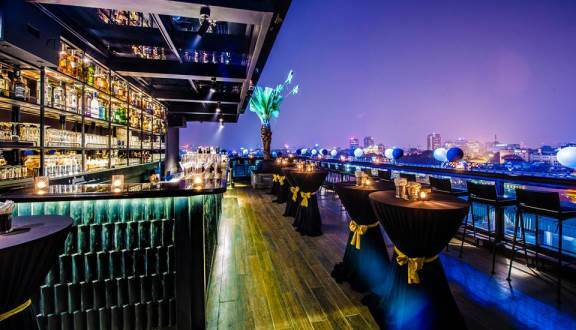 Bringing the lively atmosphere of a genuine rooftop bar, Twilight Sky also possesses extremely romantic space with a 270 degree view of the peaceful Hoan Kiem lake and the sparkling Hanoi old town at night. Reminiscent of French architecture and combined with a simple, modernist style, this restaurant gives diners a warm, comfortable feeling when coming here with their partner on Valentine’s Day. This restaurant serves, you guessed it—steaks. 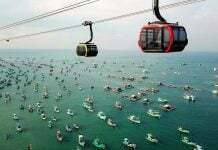 You will also find other Western specialties. 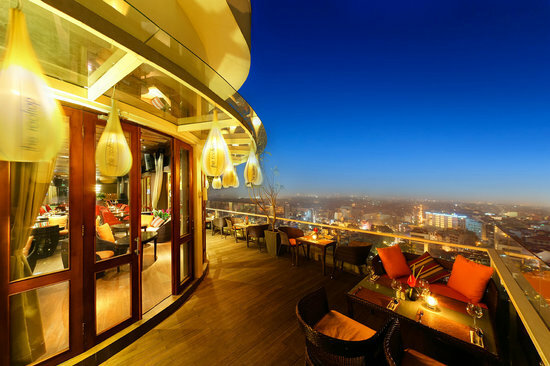 Located on the 11th floor of the Authentic hotel, Panorama Restaurant & Bar Top is a European-style restaurant with a rich menu, a unique space,and a wide view over the whole of Hoan Kiem lake.